May 5, 1935: “The Garland Sisters” were in the middle of their weeklong run at San Francisco’s Orpheum Theater. The theater is still there and still hosts a variety of shows. Clark Gable, one of the screen’s biggest box-office attractions, will re-enact his famous role of “Blackie” in “Manhattan Melodrama” when he makes a return engagement on “Good News of 1938” today. Robert Young, popular young MGM featured player, will be master-of-ceremonies for the second successive week, when the program is broadcast over the NBC-WFBC network at 8 p.m.
“How Baby Snooks Eats a Meal,” a course-by-course description of broken dishes and resultant indigestion for Daddy, will be presented by Fanny Brice as one of her famous comedy skits. And Frank Morgan will again do his best to “oust” Rober Young as master-of-ceremonies. Willson will also play two other numbers – “Something Tells Me” and the late George Gershwin’s “Love Walked In” and provide the musical accompaniment for the popular singing of Judy Garland. The 14-year-old MGM starlet is preparing special arrangements of two current hit tunes for Maxwell House Coffee. Download the complete show here (zip file). May 5, 1941: Sheilah Graham devoted her entire “Hollywood today” column to Judy and her marital plans. The column is dated May 4 but was published first published on the 5th. Although Graham reports that Judy didn’t think she and David Rose would get married, he became Judy’s first husband when they were married just a few months later on July 28, 1941. 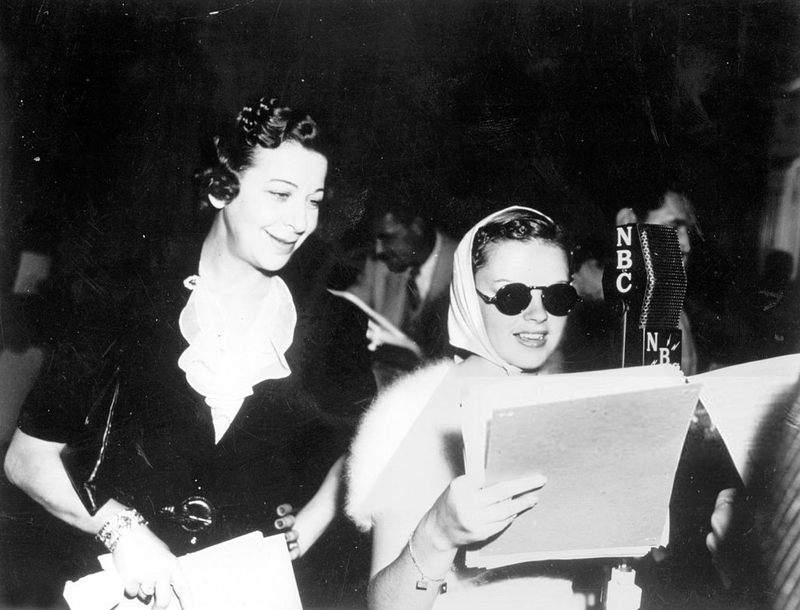 The article is filled with interesting, but untrue, factoids about Judy, such as the fact that she was buddies with Greta Garbo and that she was composing a concerto – by ear! Oh, that MGM Publicity Department! 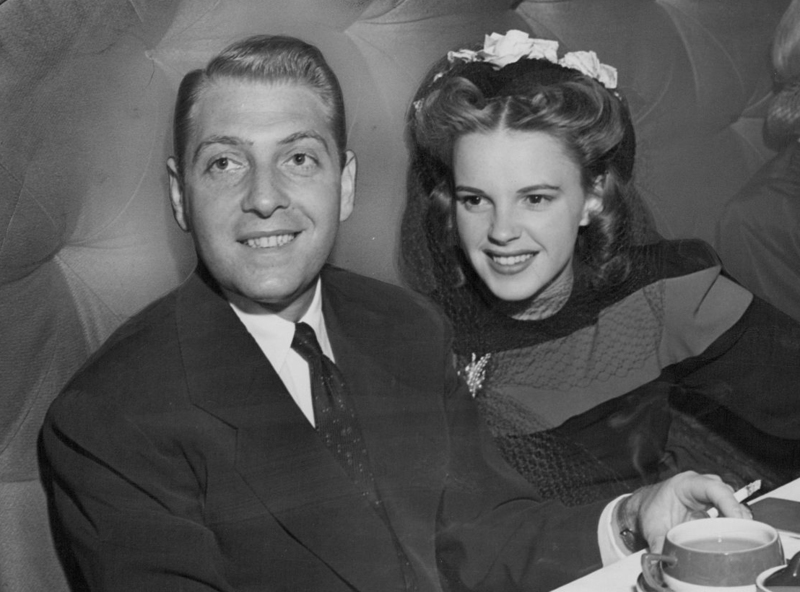 Hollywood, May 4 – Judy Garland and Dave Rose sat in front of me at the Deanna Durbin-Vaughn Paul marriage ceremony. Every one in a while Judy furtively brushed away a tear. “Of course, I cried,” she told me later in the evening. “It was so beautiful – all the music and the flowers! A few days later Judy was reversing her judgment. “When I get married, she said over tea and cakes in her Bel-Air house, “It will not be like Deanna’s. I won’t have it so publicly in a big church. I’ll have the ceremony at home. There won’t bet the 900 or so people Deanna invited. I’ll just have a few close friends. It won’t be in the evening (Deanna’s was at 8:30 P.M.), I’d like to have the sun streaming through the windows. And it won’t have all-white flowers like Deanna did. I’d like a gayer color scheme. Some girls,” continues Judy, “Dream of a big wedding and all the trimmings that go with it. And that’s all right for them. But not me. Judy’s method of taking her role in “Ziegfeld Girl” explains why, in my opinion, she stole the picture from the rest of the top starring names. When she was given the script to read, she was depressed at the smallness of her part. Then she said, “well, even though it isn’t so big, I’m going to do the best I can.” Judy’s best is very good. Judy has shed 17 pounds in the past few months, and she is delighted with her new svelte figure. “Dieting?” I asked her. “Oh, no,” said Judy cramming a cookie into her mouth, “just working hard, and then I had my tonsils out because I had laryngitis. 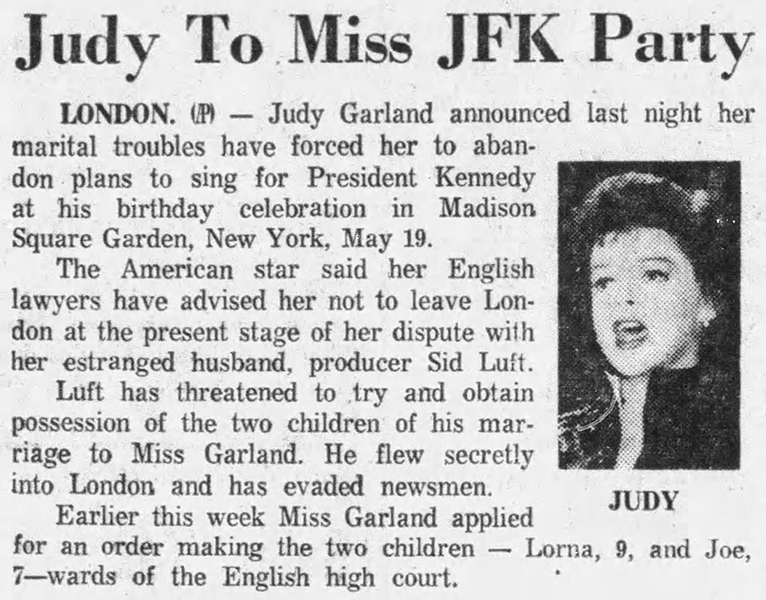 I feel so sorry for all those stars who earn a fortune, but can’t eat a good square meal.” Judy’s earning power recently was placed at $2000 a week by her Metro bosses. Seventy-five per cent of it is placed in a trust for her and will yield an income when she is 25 years old. I didn’t know that visitors were forbidden, and seeing the door open I went in. There were black screens around the camera, and I went closer to find out why. There was a sudden hush. Miss Garbo looked and looked at me, and I ran from the set. A couple of days later she passed me on the street at Metro and said, “‘Hello.’ Then said she was sorry she had frightened me. And from then on, we have been friends. How does a 19-year-old star spend her evenings in Hollywood? Just like a 19-year-old salesgirl in any small town. “I go to the movies seven times a week,” said Judy. Wednesdays and Saturdays are reserved for Dave Rose. And after the movies, they go to Ciro’s or the Mocambo, but not to dance – to talk. Mr. Rose does not like dancing. At odd moments during the past three years, Judy has written poetry. She read me some of the verses. They are quite good. She is currently composing a concerto – by year! Like Mickey Rooney, she does not read music. 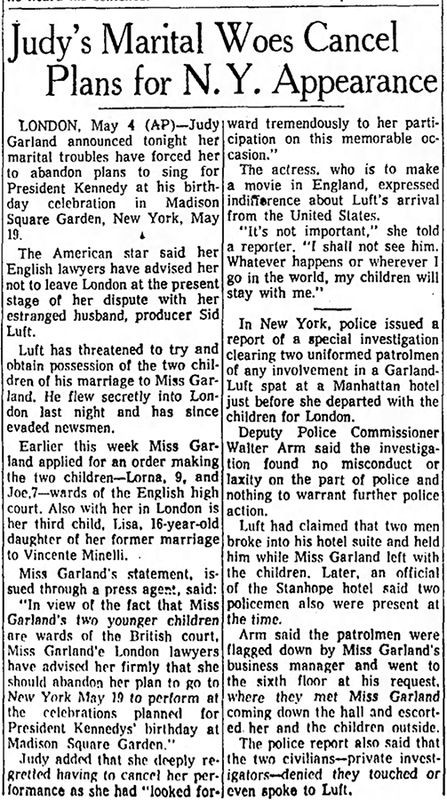 May 5, 1952: This article from the Philadelphia Inquirer relayed the story of Judy’s reception at Romanoff’s in Los Angeles after her opening at the Los Angeles Philharmonic. That took place on April 21st (the engagement lasted through May 18th). It’s interesting that the paper would run a story about something that happened two weeks prior. It’s also interesting that the paper would use a photo of Judy that was, at the time, already a decade old. 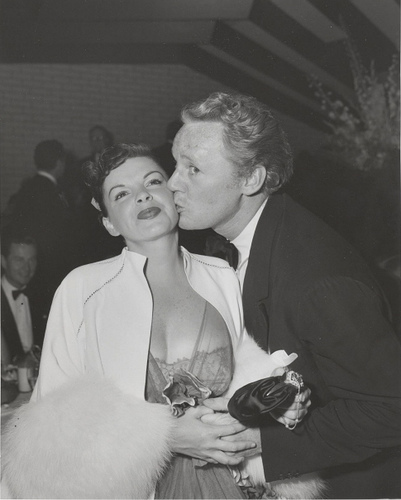 Judy Garland and Van Johnson at Romanoff’s after Garland’s Los Angeles Philharmonic opening night April 21, 1952. It’s a shame Judy was unable to attend. 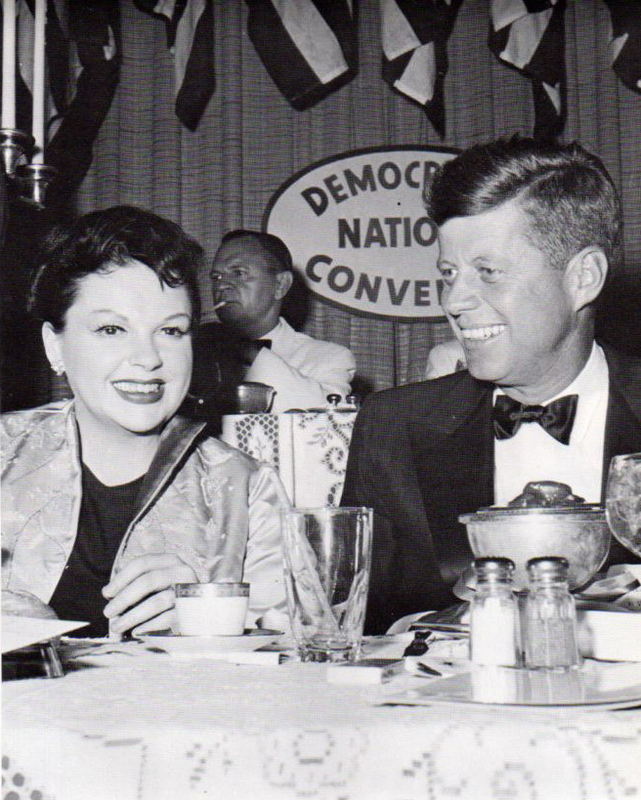 The event was filmed, and we would have hopefully had some great footage of Judy performing for her good friend, JFK. This was the birthday event at which Marilyn Monroe famously sang “Happy Birthday” to the President.